Setting an individual national record takes some serious dedication, skill, and practice. Assembling an entire team skilled enough to set a national record requires even more coordination, teamwork, and discipline. Criterion shooter James Root and the rest of Team Loader Monkey (Chris Whitney, Jack Abrams, and Nathan Abrams) fired an aggregate score of 2313-102X in the National Mid-Range Team Course (any sights, four-man team) setting the Open, High Master record at the Port Malabar Rifle & Pistol Club Snowbird X-Miss Team Match on December 28, 2017. 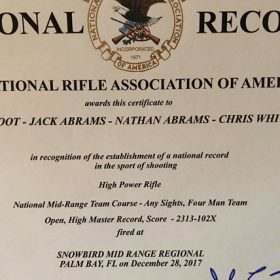 They recently received their NRA certificate confirming this new national record achievement. James achieved top billing among the four teammates, posting an impressive individual score of 595-39X. 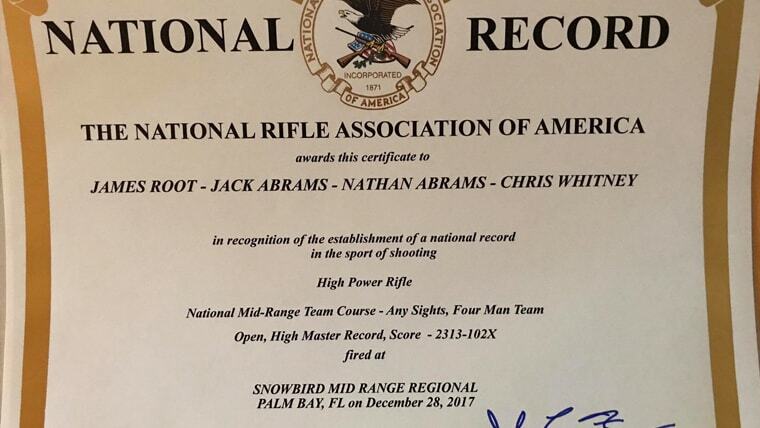 James posted an individual score of 200-17X on the 300 yard match, due in part to some excellent wind reading on the part of teammate Chris Whitney. 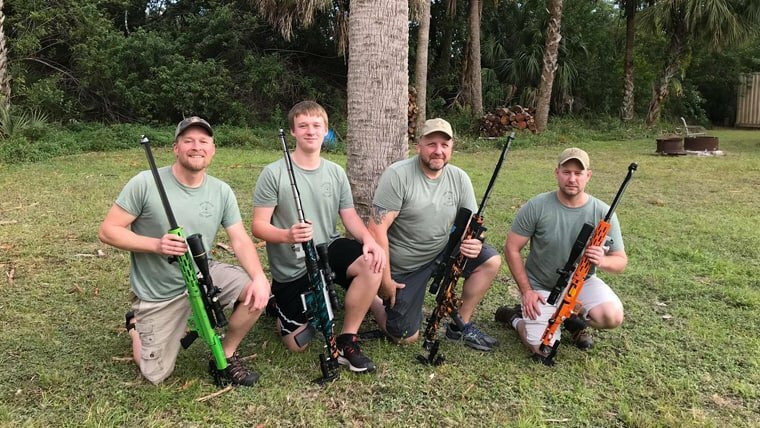 In this particular discipline James utilizes a .223 Rem Match Rem/Age pre-fit barrel purchased through Northland Shooters Supply (26”, 1-8 twist, Varmint contour). This Rem/Age pre-fit barrel is mounted to a trued Remington 700 receiver seated in Gary Eliseo’s Competition Machine F1 Chassis System. James elected to utilize the Vortex HST 4-16×44 for this particular rifle build, along with a CG 2-Stage trigger. The load utilized in this record-setting performance is comprised of Lapua brass, BR4 primers, 23.5gr. of IMR 8208, and 82gr. Berger Long Range Boat Tail bullets. Muzzle velocity with this particular load hovers around 2900 FPS. Criterion Barrels would like to extend our sincere congratulations out to James and his team. Per our policy on national record-setting customers, Criterion will be issuing James a complimentary barrel for his next rifle build project.